We're recommending some old Hollywood Christmas movies for your holiday viewing pleasure. 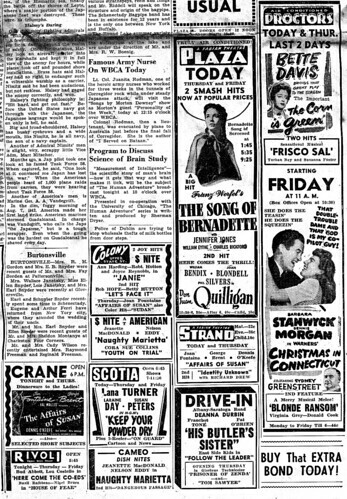 First up is Christmas in Connecticut (1945). Christmas in Connecticut is a delightful romantic comedy that deconstructs the myth of the perfect homemaker more than 30 years before Martha Stewart appeared on the scene. Elizabeth Lane (Barbara Stanwyck) is the popular lifestyle columnist for Smart Housekeeping magazine. She claims to write her column every month from her idyllic Connecticut farmhouse where she lives with her doting husband, adorable baby and an assortment of cuddly farm animals. Lane is so well-known as one of the best cooks in America that her publisher (Sydney Greenstreet) is bringing a wounded sailor (Dennis Morgan) to her farmhouse for Christmas dinner. 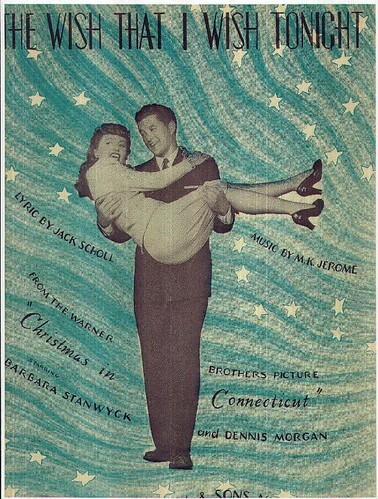 Sheet music from Christmas in Connecticut featuring Barbara Stanwyck and Dennis Morgan. The problem is nothing Lane writes is true. She doesn't have a husband, let alone an adorable baby. She lives in a cramped New York apartment, not a Connecticut manse, and all of her mouth-watering recipes come from her Uncle Felix (S.Z. Sakall), who owns a Hungarian restaurant. Lane doesn't want to blow her cover so she comes up with a desperate scheme: She will marry an architect friend (Reginald Gardiner) over the Christmas holiday and pass off his immaculate farmhouse and Uncle Felix's haute cuisine as her own to the unsuspecting publisher and sailor. Director Peter Godfrey brings a deft touch to the complicated storyline. The plot takes a little time to kick in (Stanwyck doesn't show up until about 15 minutes into the movie), but once it does, Godfrey does an excellent job of keeping the story fast-paced and coherent. He gives each member of the talented cast a moment to shine and he also adds small touches that reward repeat viewing. For example, in the Christmas barn dance scene, Stanwyck doubles over in real laughter when Gardiner literally kicks up his heels in an elaborate dance move. A vintage newspaper ad features Christmas in Connecticut. The legendary Stanwyck was at the height of her career when she made Christmas in Connecticut. She had just come off Double Indemnity (1944) where she earned a Best Actress Oscar nomination for playing a cunning femme fatale. 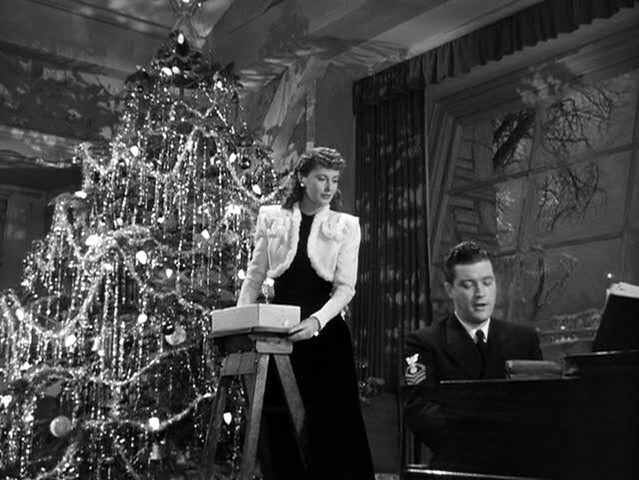 Stanwyck decided she wanted her next film to be much lighter so she chose Christmas in Connecticut. Stanwyck's co-star Dennis Morgan was a welcome presence in many Warner's movies in the 1940s. He was often featured in musicals and comedies that showcased his easygoing charm and Irish tenor. Morgan's sang two songs in Christmas and Connecticut (below): the hymn, O Little Town of Bethlehem, and the original song, The Wish That I Wish Tonight by Jack Scholl and M.K. Jerome. Christmas in Connecticut also boasts an extraordinary supporting cast. Sydney Greenstreet, who played powerhouse publisher Alexander Yardley, was fresh off of his success in The Maltese Falcon and Casablanca (he was a big enough star at the time to receive third-billing just under Stanwyck and Morgan). Greenstreet, who was a veteran Shakespearan actor, proved to be just as adept at comedy as he was at drama. His Yardley is believable as both a powerful man who can get the FBI on the phone at a moment's notice and as an old softie who likes nothing better than watching a cow get put to bed for the evening. Greenstreet was joined by his Casablanca cast-mate S.Z. Sakall, who played the frequently befuddled Uncle Felix. Christmas in Connecticut is one of the veteran character actor's best films. Sakall's excitable demeanor and mangled English make his performance the highlight of the film. Not only does he get to use his famous catchprases "everything is hunky-dunky" and "Catastroph!" but he also walks off with the best line in the film while showing Stanwyck how to make homemade pancakes: "Now I show you how to flip-flop the flop-flips." The Bottom Line: Christmas in Connecticut is a delightful comedy that will bring Christmas cheer to the whole family. Christmas in Connecticut is available on DVD and video on demand. It will air on TCM at 2 p.m. Dec. 21 and 10 p.m. Dec. 24.